I had scrambled my way along the rocky shore of the lake some one hundred and fifty stumbling yards. My destination was the base of the gray bouldered bluff that overlooked the Artillery Lake. Above me on top of the bluff was a lone bull caribou bedded out of sight some one hundred feet or so above me. Before the stalk I had made a mental note of a patch of green as a landmark to indicate where I should make my assent up the rocks. Of course now that I was there my landmark vaporized into a cloud of uncertainty. Was this the carpet of grass that I was seeing or is that olive green patch 60 yards further up the shore? Decisions, Decisions. Time was running out, if there's one thing I have learned about Barron Ground Caribou is that they are restless creatures, always on the move. I made the 2 second decision to scale it where I was, I shimmied out of my day pack and left it along with my wide brimmed hat at the base as I began my ascent up the bluff with bow in hand. The big bull had bedded up in a position to survey the open rolling tundra that seemed funnel into thi s point of the lake. I had caught a glimpse of the bulls antlers and ears scanning area below him like a radar some 45 minutes earlier. The bluff where the bull was positioned is a series of chest high rocky elevations with lichen covered ledges on which to climb upon. The width of the ledges permitted me to climb on my hands and knees for eight or ten feet or so to the next elevated ridge. Always carefully peeking over the next rise with the anticipation that this is the ledge he will be on. As I peeked over the last bench it was only about 3 feet high so I had to belly crawl to the edge to peer over the edge onto the next flat. As I peered over the edge the first thing I see are the velveted sweeping antlers of the bull silhouetted against the skyline. He was standing directly in front of me and looking the opposite direction. While kneeling I quietly nocked an arrow and began to range him. In the instant I peered though my range finder I could see his long sweeping rack and and double shovel rotate to lock in on my position. It was as if this majestic animal had sensed me. I froze with range finder glued to my eye while he stared me down 29 yards away. After an intense stare he began a fast walk to my left. I came to full draw and estimated him at 35 yards and released, but missed. Hhmm, imagine that! With this miss the caribou shifted into their trademark camel like trot. He disappeared over the ridge but running parallel to the lake. It was a remote chance I thought, but I could cut him off at the bottom of the ridge if I hurried. Caribou have short memories and will often trot out of sight only to immediately start feeding again. I thought I've got nothing to lose. What took me 15 minutes to climb up took me seconds to scale back down. After five days of hunting I again found myself in a familiar bent at the waist run to head off a caribou. Numerous daily half mile stalks in the open tundra had gotten me close several times only to have some unimagined turn of fate to keep the caribou just out of bow range. 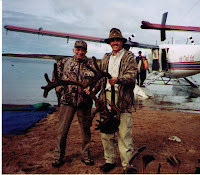 After five days I was a little wiser as to my predictions on intercepting a caribou. As I hurdled from rock to rock along the bolder laden shore on another two hundred yard dash my Lacrosse boots were not offering much ankle support. The rubber boots were a strategic compromise with the many bogs that I managed to “ muck” my way through in these barren ground valleys. Destiny would have it that he was ahead of me along the edge of the lake. I had the bluff to my back while I stalked to within the long side of my range. He simply paused at the edge of the lake as I ranged him again at 52 yard exactly. The flight of the arrow was easy to follow as it arced its way to the shoulder of the bull. Crack! The bull exploded in a blind run directly away from me.... and directly into the lake! finally a big beautiful caribou and possibly a Pope and Young class one at that. My elation was short lived as I realized my hard earned caribou was floating away from shore. Artillery lake is a huge lake feed by a series of rivers. Apparently there was a gentle current along this shore. My guide would not be back with the boat for at least two hours. The decision to go swimming when you are 70 miles from the Arctic Circle in September is something not to be taken lightly. Earlier in the week the guides and the rest of the gang were discussing survivability in the event of a capsized boat. The odds weren't good. I thought it out carefully for about three seconds. The key is keeping dry I said to my self. Off came my boots, clothes and thermals. I did leave my underwear on as even in the no mans lands of the North West Territories a man still needs his dignity. excruciating, but I push on through the chilly water with my eyes focused on the floating prize. The frigid water is now chest deep and I am only feet away from the bull. Finally he is within reach and I stretch my hand out trying to avoid immersing my body any further into the icy lake than necessary. His vascular filled mahogany colored velvet antlers were welcome warmth to my cold numb fingers as they grasped him. In an instant I had gone from extreme trepidation and fear to feeling like nothing can go wrong now. With caribou in tow I made my way back to shore. After I was out of the water the beet red color from the top of my chest down served as an obvious indicator to the waters depth. The speed in which I put my dry clothes and boots back on was impressive, but what was truly amazing was that I never got a chill or shiver during or after my arctic swim. Goes to show you what a good dose of adrenaline can do for you. Or was it shock? Once I had my bull safely ashore I sat there on a rock in the silence that was occasionally broken up by the lapping of the waves from the lake and reflected on the experience. Reflecting not only of the taking of this bull but of the five hard hunting days leading up to it. 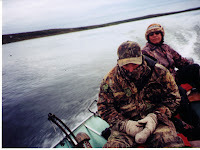 Memories of many hunts grow foggy with time but I was certain this trip to the Canadian North West Territories was one that was one that will be etched a little deeper into my mind than the rest. Jim Taylor, Tom Nelson, Mac MacKool, Todd, Paul Barry. Guide was Henry- Inuit Indian.